Nov. 1, 2011, 2 p.m. The new gadget site features big, bold visuals, room for community, and lots of structured data. By Joshua Benton @jbenton Nov. 1, 2011, 2 p.m.
POSTED Nov. 1, 2011, 2 p.m.
Benton, Joshua. "Three lessons news sites can take from the launch of The Verge." Nieman Journalism Lab. Nieman Foundation for Journalism at Harvard, 1 Nov. 2011. Web. 19 Apr. 2019. Benton, Joshua. 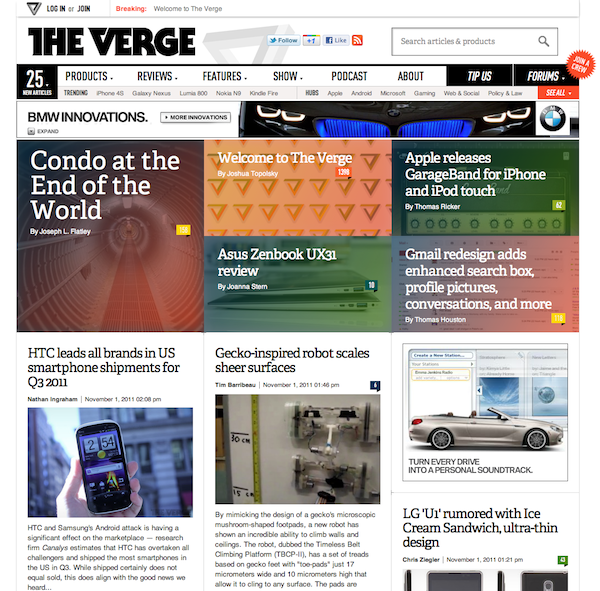 "Three lessons news sites can take from the launch of The Verge." Nieman Journalism Lab. Last modified November 1, 2011. Accessed April 19, 2019. https://www.niemanlab.org/2011/11/three-lessons-news-sites-can-take-from-the-launch-of-the-verge/.